Rob Johnstone, a national expert and researcher on guided pathways, will be on campus Monday, Feb. 5 for a keynote presentation and breakout sessions. What are guided pathways? In short, it’s a model of restructuring student services and scheduling to create a more clear path for students to meet their goals. Have questions about what it is or wondering which campuses have implemented it and whether it’s been effective? Johnstone is a good person to ask. There will be break-out sessions for faculty and classified staff and opportunity to ask him questions. Johnstone advises that the keynote address will provide the necessary background for more productive breakout sessions. You can review the agenda and other relevant linked information about guided pathways on the events page. This entry was posted in Uncategorized on January 29, 2018 by Marsha Sills. Lane is the community’s college and there’s an opportunity to give your input about the community by participating in Lane County’s strategic planning process. The county is currently seeking input to update its 2018-2021 strategic plan through a survey. There is also an open house where you can learn more about the framework of the process from 5:30 to 7 p.m. Wednesday, Jan. 24 in Harris Hall, 125 E. 8th Avenue, downtown Eugene. Last year, a team of employees was trained in Appreciative Inquiry practices and several of the trainees are going through the certification process, which requires them to give a presentation. If you’re interested in learning more or in a training for you or your department, email sillsm@lanecc.edu. This entry was posted in Uncategorized on January 22, 2018 by Marsha Sills. – Martin Luther King, Jr., March for Integrated Schools, April 18, 1959. Imagine someone reading words you uttered and history showing you lived by those words. We do not need to imagine when reading the words of the Rev. Martin Luther King, Jr.
On Monday, the local NAACP chapter has organized a march and community program. Those interested in the march are encouraged to start congregating at Autzen Stadium at 9 a.m., so the group can organize and leave the parking lot at 10 a.m. to begin the march to the Shedd Institute downtown. At the Shedd, there will be a program from 11 a.m. to noon featuring community leaders, the youth council and activists who will share their vision and hopes for our community. On Wednesday, March 17, Lane will have our own MLK Celebration featuring Nina Turner. Turner is a former Ohio state senator and contributor on CNN and other news programs. Last year, she was also tapped to lead Bernie Sander’s group that reaches out to potential leaders. The event starts at 5:30 p.m. and is open to the public. Please extend an invitation to your colleagues, family, friends and neighbors and help us create community here at Lane. Some of our students have stepped up to volunteer for our MLK Celebration event. If you’re interested in volunteering, let me know by emailing me at: sillsm@lanecc.edu. The motto, “A Day On, Not a Day Off” has been adopted to designate the holiday as one of service to honor King’s legacy. How do you plan to make it a “day on” through service to your family or community? Share by leaving a reply for us. This entry was posted in Uncategorized on January 11, 2018 by Marsha Sills. Have you forgone resolutions this year? The new year ushers in reflections on what was, what is and what will be. May we carry the resolve of reflection with us into the days ahead. Jan. 19: Current cohort monthly seminar on strategic planning at Lane and interactive planning exercises using Appreciative Inquiry with Jen Steele, Deborah Butler and Lida Herburger. Jan. 25: Alumni book club at 3 p.m. in Building 19, Room 142 to discuss selection, “Lean In” by Sheryl Sandberg. Both sessions will be held in the Gender Equity Center in Building 1. 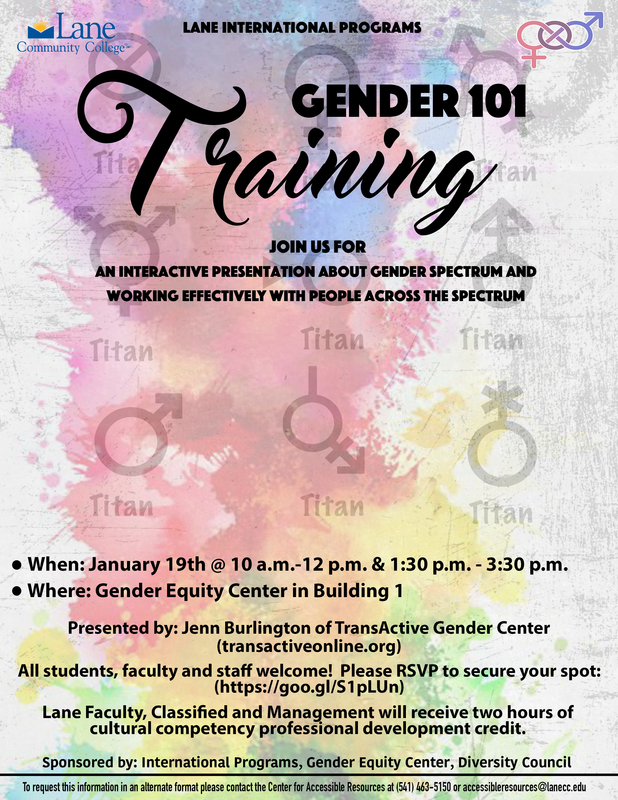 The training is presented by Jenn Burlington of TransActive Gender Center. 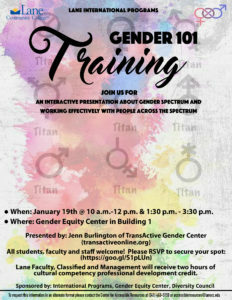 Check out http://transactiveonline.org for more information about the TransActive Gender Center. The presentation is sponsored by International Programs, Gender Equity Center and Diversity Council. Employees will receive two hours of cultural competency professional development credit for attendance. Leadership author, John C. Maxwell offers these tips on developing listening skills as a leader in an article he wrote in 2014 for the magazine, Success. In the article, he shares a story of the importance of not only listening, but asking the right questions. 1. Am I open to other people’s ideas? 2. Am I open to changing my opinion based on new information? 3. Am I actively seeking feedback and input in order to move the team forward? 4. Do I act defensively when criticized, or do I listen openly for the truth? 5. Do I ask questions in every conversation? At the end of each day, reflect on the day’s interactions—every meeting, conference call, phone conversation and so on—and calculate the percentage of the time that you spent listening as opposed to the time you spent speaking. How much of the day were you actively taking in information? At the end of the week, tally up your percentages and get an average. Set a goal to increase your listening percentage in the upcoming week. Be sure to track your progress. Connecting. In my book The 21 Irrefutable Laws of Leadership, I write about the Law of Connection, which states, “Leaders touch a heart before they ask for a hand.” You cannot connect with other people when you are the one doing all the talking! Do this intentionally. Stop, make eye contact and be fully present, and you’ll find yourself truly connecting—not half-listening. Building confidence. Take time to listen to each person on your team. New people, in particular, offer a fresh perspective that can lead to valuable insights, but they may not feel they have the right to contribute their thoughts. Shake their insecurity by soliciting their ideas and taking those suggestions to heart. Henry David Thoreau once said, “The greatest compliment that was ever paid me was when someone asked me what I thought and attended to my answer.” Don’t you feel the same way? Taking action. With your new focus on intentional listening, you will probably find that you have an abundance of good ideas at your fingertips. Just hearing them isn’t enough. Good ideas have expiration dates. You need to act before they become dated, irrelevant or otherwise spoiled. A bonus: Members of your team will see your responsiveness, feel valued, trust you with their ideas and keep bringing them forward. Reflecting nightly. Maximize your new habits by taking time before bed to think and reflect so you can process and apply what you have learned. I challenge you to become the opposite—a small ego with big ears. Because that’s the kind of person who truly excels. This entry was posted in Uncategorized on January 2, 2018 by Marsha Sills.